After acting in two of Ben Wheatley’s films – Kill List (2011) and Sightseers (2012) – and co-writing the latter, Steve Oram strikes hard with his first opus as director. Sightseers opened with a long series of moans uttered by the unhappy mother, and here Oram limits his dialogue to just that. The film starts with Oram and Tom Meeten (it would be pointless to give them names, even though each character is duly attributed one in the final credits) crossing the woods and performing a strange ritual of urinating on the picture of an ex-wife or girlfriend without uttering a single intelligible syllable, contenting themselves with expressive grunts and growls. This sets the scene for the remaining 80 minutes. For Aaaaaaaah! is a Planet of the Apes, the other way round. Rather than having the apes evolve to a near human level of civilisation, Oram prefers to bring Londoners down to their very primal selves. 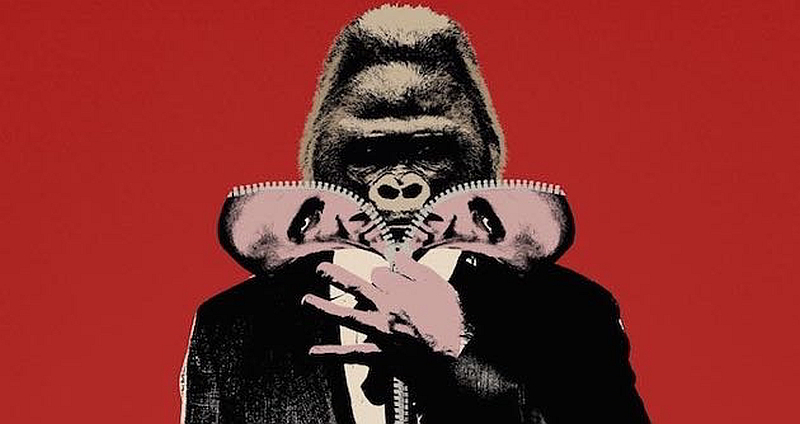 Seeing Julian Rhind-Tutt going ape is a delight in itself, and most likely a turning point in his career, but beyond the comic effect of the concept, Oram shows how little our behaviour as well as family and social structures have evolved since we were apes ourselves. Although Oram denies any attempt at serious social criticism, the modern consumer society so perfectly fits the animal struggle for food, territory and a dominant position within the group that by the end of the film the rudimentary and limited communication between the characters sounds like an improvement over the compulsive use of the F-word in so many contemporary productions. With his debut experiment, Oram vindicates the importance of slapstick comedy and fart jokes (aren’t they timeless after all? ), and the final TV show compulsively enjoyed by the surviving homicidal outcast heralds tomorrow’s post-reality-television. Don’t say you haven’t been warned!